Honeymoons in Peru will usually start with arrival in Lima, and depending on your flight time you’ll either spend a night here or fly on to your next destination: Arequipa. This beautiful colonial city is the perfect place to relax, but once you’ve acclimatised it also happens to be an excellent base for climbing El Misti – one of the volcanos visible from just about everywhere in Arequipa. You can choose to tackle El Misti in a group, or for a more exclusive experience you can opt to travel with only a guide accompanying you. The climb takes two days altogether – on the first day you’ll climb to the base camp to spend the night, and then on day two you’ll reach the summit and head back down to Arequipa for a well-earned evening meal. Perhaps a juicy alpaca steak and a romantic bottle of wine to celebrate your achievement! After your first mountain climbing adventure, it’s time for some more relaxed sightseeing and luxury accommodation! Just outside Arequipa sits Colca Canyon – more than twice as deep as the Grand Canyon and home of the spectacular Andean Condors, this is a must-visit stop on your honeymoon! 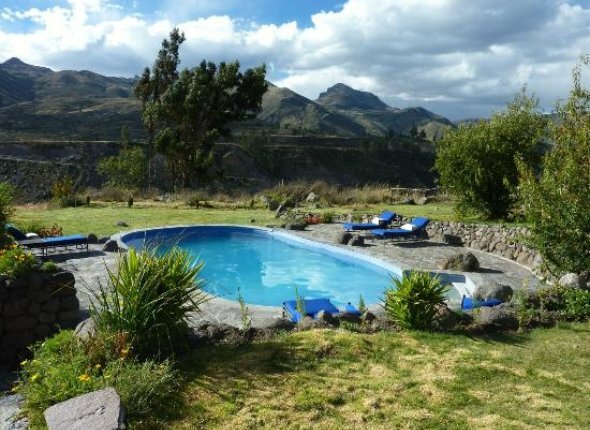 For honeymoons in Peru, we recommend staying at the Casitas del Colca, where you can relax in your private cottage or have a soak in the hot springs after a long day of activities in the canyon. While most people only spend one night at Colca Canyon, we recommend two for honeymooners, especially as Casitas del Colca is rated by Conde Nast as one of the best hotels in the world! After a final morning in Colca watching the condors, catch a coach to the city of Puno, which sits on the shores of Lake Titicaca. As there isn’t a whole lot going on in Puno itself, we strongly recommend staying in one of the lovely lakefront hotels – our favourite is the Casa Andina Private Collection in a superior lake view room. As the hotel has its own dock, it’s the perfect base for exploring Lake Titicaca by private boat tour, or if you’ve had enough relaxation up to now you might consider renting some kayaks! However you choose to spend your time at Lake Titicaca, the next stop on your Peru honeymoon is Cusco. The famous Andean Explorer train is without a doubt the most honeymoon-appropriate mode of transportation between Puno and Cusco, and when you arrive at the station in Cusco we recommend heading straight into the Sacred Valley for the perfect combination of action and luxury. Here you’ll find some of the loveliest hotels in all of Peru, including the Sol y Luna. This luxury hotel offers a range of private casitas, including some with private hot tubs – perfect for winding down after taking part in one of the valley’s many activities! The Sacred Valley is home to the Urubamaba River which is excellent for white-water rafting, but if you’d rather stay dry there are numerous mountain bike and horseback riding trails as well. After your time in the Valley it’s back to Cusco by private car to explore the city for a few days. There are almost too many hotels in Cusco for us to choose from, but some of our favourites for honeymoons in Peru are the Picoaga (get a colonial room! ), the Aranwa Boutique Hotel, and if you’re really looking to splash out, the Palacio Nazarenas. After visiting every nook and cranny of this fascinating city, it’s time to prepare for the true highlight of your honeymoon – the Inca Trail to Machu Picchu. There are few things that match up to hiking through the Andes, camping in the mountains, and exploring ancient Inca ruins. These elements combined make the Inca Trail an incredibly special experience to share as a newly married couple, creating memories that will last a lifetime. At the conclusion of the trek you’ll spend a full day at Machu Picchu before heading down to the small town of Machu Picchu Pueblo for a night at the Inkaterra Pueblo. Here you’ll enjoy a three course meal in their gourmet restaurant, followed by an evening relaxing in front of the crackling fire in your room. The Inkaterra hotel offers several different walks and tours in the surrounding area, and you might find it worth spending two nights here, especially if you want to re-visit Machu Picchu. Eventually you’ll have to check out of this heavenly cloud forest sanctuary and catch the train back down to Cusco, where a private transfer will take you back to your hotel. If you haven’t run out of time (or steam!) 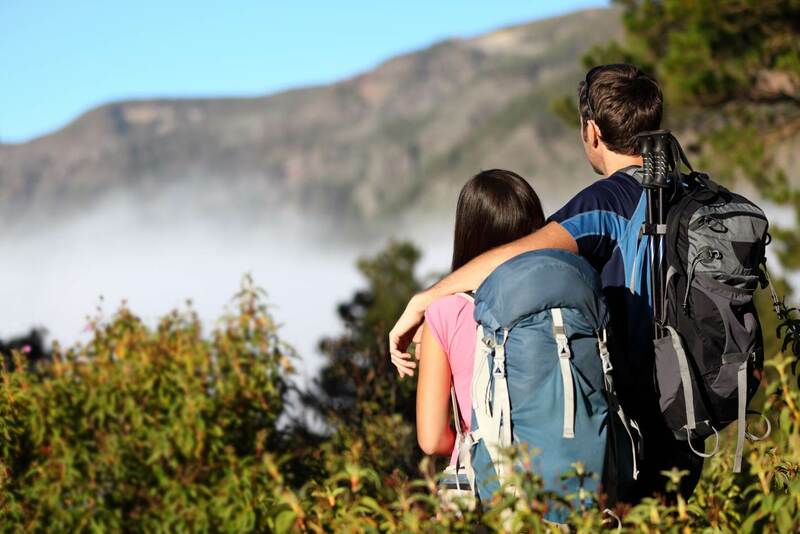 yet, we find that the perfect end to adventure honeymoons in Peru is to go for one final adventure by taking a flight into the Amazon jungle, and the fantastic Reserva Amazonica? Unlike most jungle lodges, the Reserva Amazonica has private cabana accommodation and operates on a “choose your own itinerary” basis rather than a fixed programme. This gives you the flexibility to participate only in the excursions you choose, including the option of just having a lie in! Sadly, after exploring the Amazon, kayaking on Lake Titicaca, trekking the Inca Trail, condor spotting, white water rafting, horseback riding, and climbing a volcano, your luxurious adventure honeymoon in Peru comes to an end with your return to Lima to catch the flight back home. You’ve experienced things that most people never do, and you can start your married life confident in the knowledge that your honeymoon truly was as special as can be!